A white diamond's color is one of the four C's that significantly affects its value. Diamonds with the least amount of color, which are graded D, E, and F, are rare and command higher prices than diamonds with yellow or brownish undertones. On the other end of the spectrum, vivid and natural fancy color diamonds are even more unique with price tags to reflect their rarity. The richer the shade on a fancy colored diamond, the more valuable it becomes. Not many people knew about colored diamonds until J-Lo got a pink diamond ring from Ben Affleck which sparked a frenzied demand for diamonds with color. Since these diamonds are significantly more rare than white diamonds, the jewelry industry developed methods to turn cheap, low-quality diamonds into replicas of these showstopping gems to meet the demand. So how are these manufactured colored diamonds made? We'll explore some of the most common methods. Remember, like other diamond treatments, only some of the methods used to enhance the stones are permanent. Want a white diamond to look blue or pink? Coat it! These coatings applied to change a diamond's color are not permanent and are nearly always done to deceive the buyer. These diamonds are coated with a substance that masks yellowish tints. Though it is applied with heat, the coating will eventually rub off with normal wear and cleaning. This coating method is used to create fancy pink diamonds since not many companies have been able to irradiate a low-quality diamond to a pink color successfully. Sometimes dots or larger areas of purple or blue ink are painted on the diamond to help counteract a yellowish color. 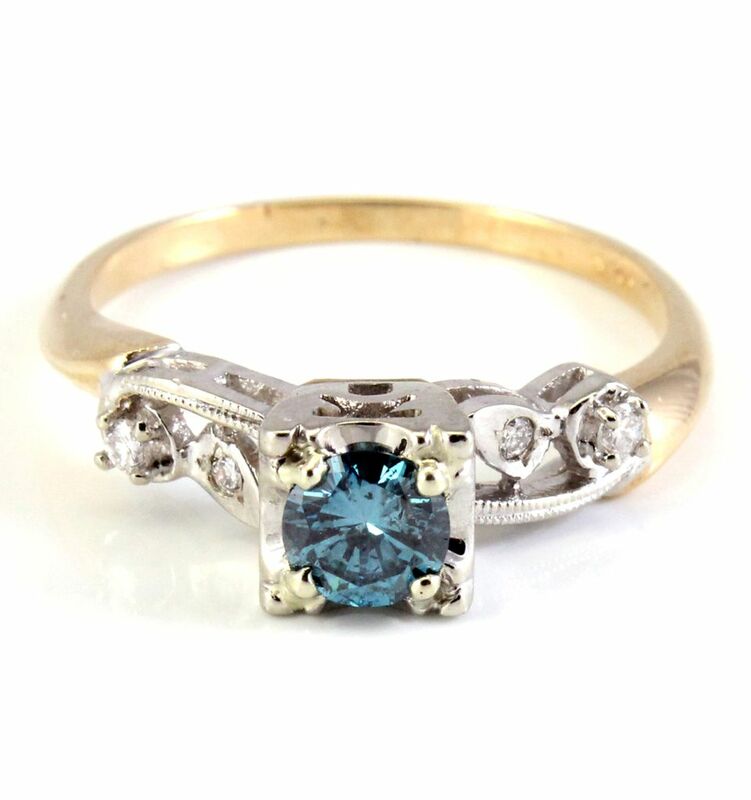 The dots are usually obscured by the diamond's setting, so they are difficult to see in a mounted stone. The coating can usually be removed with water or cleaning solutions. Irradiation, or exposing the diamond to radiation, followed by high pressure, high-temperature treatment, can turn brown and yellow diamonds into fancy colored diamonds. Colors produced range from green, vivid yellow, blue, purple, red, and sometimes pink. The color is usually permanent but could change if high heat is used during future setting repairs. All irradiated diamonds should have full disclosure. However, most irradiated diamonds have a very particular coloring to them that can be easy to spot once you've seen enough of them. Google image search "irradiated diamond" to see what we mean. Natural fancy colored diamonds are expensive and out of reach to many buyers. A certificate from a respected grading lab should accompany all fancy colored diamonds that are marketed as natural. Question the ethics of anyone who attempts to sell you a natural fancy colored diamond for a bargain price. Treatment-produced fancy colors are affordable and allow more of us to own a brightly colored diamond. These diamonds should not be considered an investment in the same way a natural colored diamond would. Buy the diamond because you love it, not because you think you can sell it for a profit later. Ask the jeweler for care instructions when you buy an irradiated fancy color diamond. HPHT was first used to turn yellowish diamonds into fancy colored diamonds, but now it is also used to transform some unpopular brownish diamonds into more expensive colorless diamonds. Some companies claim HPHT isn't a treatment at all, calling it a technique that finishes the job nature started. That attitude and the fact that the process is difficult to detect has made HPHT a controversial topic. General Electric is producing colorless diamonds, called Bellataire, from type IIa diamonds that are nitrogen-free. The company has applied for a patent on the process used to transform the stones. GE's position is that the process they use restores diamonds to their colorless state. Gemological Institute of America (GIA) grading reports now indicate when HPHT treatments are detected by stating "HPHT Annealed" or "Artificially Irradiated" in the Origins portion of a report. Only diamonds that are laser-inscribed with the words "HPHT PROCESSED," "IRRADIATED," or a specific registered name are graded. GE uses a registration number and the letters "GE POL" to inscribe their diamonds. There have been instances where inscribed lettering has been removed before a diamond was submitted for grading. HPHT will continue to be a controversial topic, with grading labs trying to perfect ways to detect the always-improving process so that consumers can receive full disclosure about the diamonds they purchase. Should you purchase an HPHT diamond? You're the only one who can make that decision. The diamonds are gorgeous, but choosing between altered and natural is a personal decision. The Federal Trade Commission (FTC) requires that HPHT is disclosed. Most HPHT diamonds weigh over 1/2 carat. HPHT diamonds should cost less than similar natural diamonds.